Our main goal in teaching spiritual leadership is to help Christian leaders. We have encountered hundreds of discouraged men and women who were ready to resign their leadership positions but retained a heartfelt desire to serve God. As we helped them discover God’s agenda, leaders from all walks of life found encouragement and direction for their lives and organizations. We do not exclusively teach those engaged in full-time Christian work, although those serving in vocational ministry can certainly benefit from the truths we discuss. The guidelines we present are relevant to all Christians who desire to be spiritual leaders. Spiritual leadership is not an occupation; it is a calling. Christian businesspeople, physicians, educators, politicians, and parents should all be spiritual leaders. More and more people in “secular” occupations are taking their calling as spiritual leaders seriously, and they are impacting the world and extending God’s kingdom as a result. People can only lead effectively once they understand leadership in light of their divine calling. According to the Bible, God is not necessarily looking for leaders; He is looking for servants (Isa. 59:16; Ezek. 22:30). When God finds people who are willing to be molded into His servants, the possibilities are limitless. 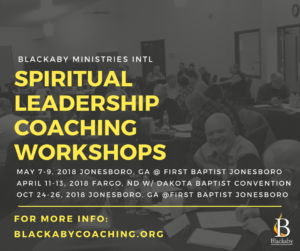 If you have questions about spiritual leadership, or if you would like to schedule a leadership event, please contact Rick Fisher at rfisher@blackaby.org. Most of us would admit that we could lead at a higher level if we had a coach to help us maximize our strengths, work through our weaknesses, and hold us accountable on the commitments we make to God, others, and ourselves. God knows our full potential, and He wants to grow us as leaders. Sometimes we need someone to help us recognize what God is doing in, around, and through us. Are you or your organization in that place right now? Either as one-on-one coaching for you or facilitated team coaching for your entire leadership team, a trained, BMI-certified Leadership Coach is standing by to help. Find out if a workshop or leadership coaching is right for you. Leadership can be a solitary and often thankless task. The Blackaby Spiritual Leadership Network is a place where leaders from any walk of life can share ideas, seek insight, offer guidance, and encourage each other through the trials they inevitably experience. This unique network is not designed exclusively for spiritual leaders but also for those who serve in business, government, the military, and the home. Learn more about our Spiritual Leadership Conferences. 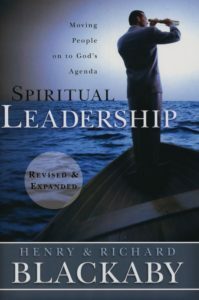 Drawing upon their own extensive leadership experience as well as their ministry to leaders in all walks of life, Henry and Richard Blackaby offer insightful counsel into the ways God develops, guides, and empowers spiritual leaders. Clear guidance is given on how leaders can make a positive impact on the people and organizations they are currently leading. See how God applies leadership principles in the life of the great biblical leader Joshua. Learn what did God have in mind when He saw Joshua as a young slave in Egypt. See how He molded and shaped Joshua to prepare him for service. Through Joshua and numerous examples from their own lives, the authors create a picture of God’s ways, offering deep insight that readers can apply to their own lives. Purpose, Obedience, Faith, Character, and Influence are among the themes that are included in the book; key truths are emphasized at the end of each chapter. A Weekday Spiritual Oasis Bestselling Author and speaker Richard Blackaby offers readers in the workplace a way to replenish their faith. ‘If you were to ask me where I see God at work today,’ writes Richard Blackaby, acclaimed speaker and bestselling co-author, with his father Henry Blackaby, of Experiencing God, ‘ I would tell you, In the marketplace.’ This observation has birthed his newest book The Inspired Leader: 101 Biblical Reflections for Becoming a Person of Influence.